Creative Kids Art Time begins on Wednesday, November 7! This new after-school program will meet the 1st and 3rd Wednesday of each month from 3:30-4:30 pm. 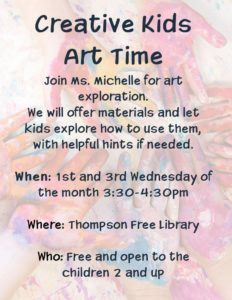 The library will provide materials for creative art exploration, for children ages two and up.